This terracotta head, at around 2000 years old, is a rare exception. 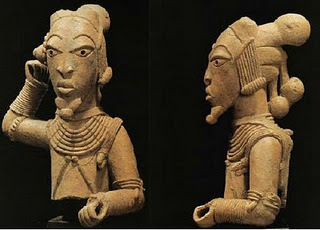 Excavated from a village in Nigeria, this is one of the best-preserved examples of its kind ever discovered. 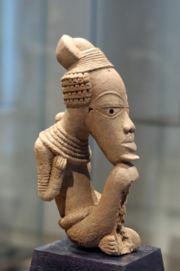 It is a product of the Nok culture that flourished from about 1000 BC to AD 500, when it mysteriously died out, and provides examples of the earliest figurative art in sub-Saharan Africa. Archaeologists Peter Breunig and Nicole Rupp of the Goethe-University Frankfurt in Germany uncovered the head during the 2010 field season. It was found in Kushe, a small village about 150 kilometres north of the capital Abuja. Amazingly, this specimen was very close to the surface - only 60 centimetres down. The Nok terracottas are a mystery. No one knows for sure what they were used for. They may represent dead members of the Nok community and could have been a votive offering at a shrine. Alternatively, the figurines may have been grave goods. Africa has seen a resurgence of archaeological activity to investigate Nok culture. Part of this has to do with interest in Iron Age societies in Africa, which is surging as anthropologists consider how technologies - especially those based on iron - spread. The Nok are considered to be one of the earliest, if not the earliest, people to smelt iron on the African continent. However, the research is under threat. 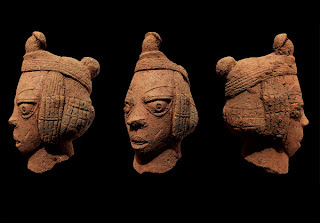 Over the past half-century countless Nok terracotta specimens have been looted from hundreds of sites in central Nigeria. The booty has found its way onto the international art and antiquities market, ending up in the hands of private art collectors. are characteristic of an artistic style that endured long after the disappearance of the Nok. The Nok terracotta people thrived from about 1000 BC to 200 AD. This may not have been a "civilization" as much as a guild who specialized in the production of these distinctive red terracotta figures. Among them was another guild or caste of iron workers. The metal workers and the terracotta workers would have been in the service of the rulers. French archaeologists have located evidence of iron-smelting in the Termit Hills of Niger from as early as 1400 B.C. The ancestors of these people were probably Nilotes who migrated from the Nile to Lake Chad and along the great river basins that constitute the Benue Trough. The Igbo belong to MtDNA haplogroup L1, which first appeared approximately 150,000 to 170,000 years ago in East Africa. The Nilotic origin of many Igbo words is evident in the correspondance to ancient Egyptian words. The adornments are Bantu, suggesting a connection to the Volta-Niger language group. 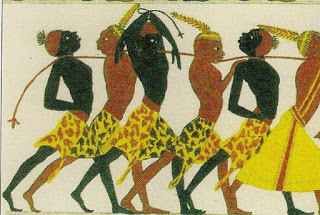 However, the reddish tone of the figurines suggests a Nilotic connection, possibly to the red Nubians. 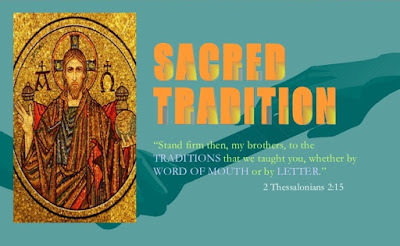 The first workers of metal in the Bible are associated with the ruling line of Kain (Genesis 4). One of his descendants, Tubal-Cain, "forged all kinds of tools out of bronze and iron. Tubal-Cain's sister was Naamah." (Gen. 4:22) Naamah married her patrilineal cousin Methusaleh and named their first born son Lamech after her father. Kain was a Proto-Saharan ruler who left his homeland and went eastward where he married into the royal house of Enoch/Anak. Anak's people were Proto-Saharan cattle-herders. In the Bible they are called Anakim, and are described as the "mighty men of old." The Proto-Saharans believed that the king or chief was divinely appointed by the overshadowing of the sun. 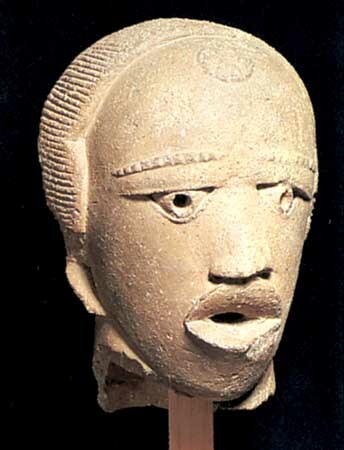 Note the solar symbol on the forehead of this Nok bust found near Jemaa, Nigeria. The word Nok may be related to the Igbo word anochi which refers to rulers, or to the ritual of removing teeth which is called Naak. Or the word may be related to the biblical word anak. 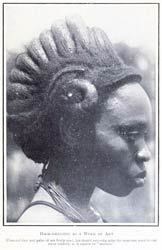 This is similar to the style worn by Igbo women today. A Yoruba word is "niki"
Niki is related to the word nkisi or nkishi (also minkisi, zinkisi) referring to objects inhabited by spirits. The NK root is evident in all forms of the word. This is further evidence that the Nok figurines were probably ancestor figurines, what the Bible "teraphim." Tera refers to priestly ancestor.